How Much of the Gulf is Leased? A BoingBoing commenter on my “Who Really Owns the Gulf of Mexico” post points out that there are plenty of non-leased cells in the map highlighted in that piece, and suggests that people check out the following map, too. This is just a detail; you can download the larger version here. But I think it just further underscores the notion of a corporate feeding frenzy around our Gulf resources. The leased areas are denoted in green. There are 6,652 of them, covering 35,637,392 acres–more than 22 percent of the leaseable Gulf. 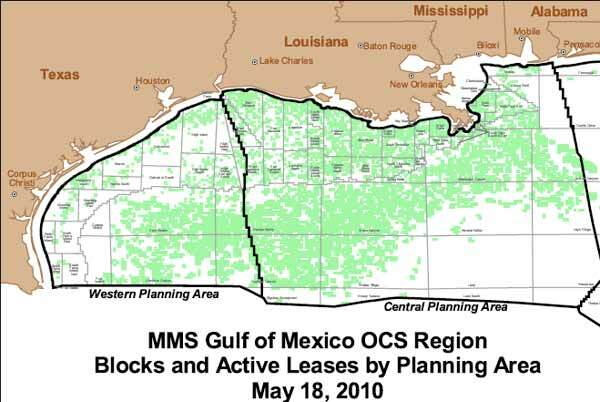 Most active parts of the Gulf: Leased areas are green.